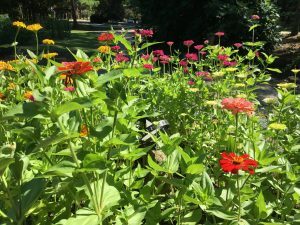 For those with floral gardens, we now have a colorful mix of zinnias. Resident Dave Waters started in the winter season with his Hellebores and has continued to have blooms throughout the seasons with Brugmansia, Hibiscus, Star Lilies and Salvia, to name just a few. In his vegetable garden, resident Allen Page has planted tomatoes, cucumbers, basil, peppers and arugula. He says he is turning green from all of the arugula they have been eating! And at her home outside of her ground floor patio, Audrey Austin has planted Begonias, Caladium and Shasta Daisies. At her neighbor’s request, she has extended her garden to include his back patio too. Goldie Coates has found her favorite spot for gardening on the balcony of her building. We all enjoy her caladiums with their big elephant shaped leaves with a colorful mix of pinks, reds and greens. What has been successful and why? Everyone was quick to say the rain has been the biggest reason for success this year. Thom Morgan, Springmoor’s Landscape Designer, says 1.7” fell in June and 3.9” in July. When it’s not raining, watering is the key. Do you have a favorite gardening tip that you can pass along to incoming residents? Audrey’s quote is the best: “LOCATION – plants are like real estate – location is everything! 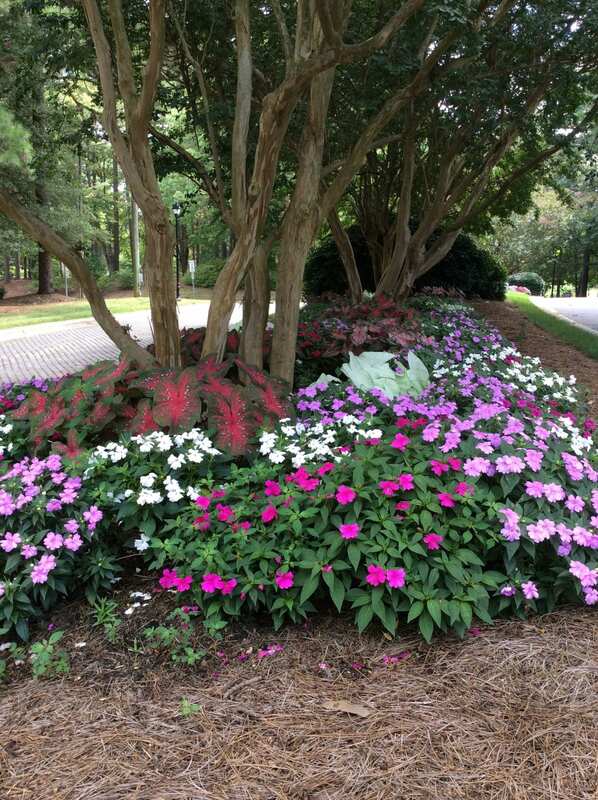 Sun exposure, moisture, mulch, fertilizer and preparation are keys to a successful garden. Where do you shop for your gardening supplies? Raleigh has an abundance of gardening supply stores. 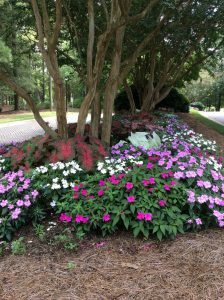 Logan’s One Stop Garden Shop, located in downtown Raleigh, and Homewood Nursery, a few miles from Springmoor in North Raleigh, are two of the favorites. Home Depot, less than two miles away, is a quick drive away for all of your tools as well as a variety of plants. Did you have a problem with bunnies and deer this year? We have noticed lots more fences around your gardens this year than last year. Lindsay Hornthal used deer and rabbit spray and stuck her “pigs can fly” ornament in the middle of her cukes and she had great success! Audrey’s flower garden is protected by red pepper. She says the deer have quickly decided they don’t like her garden. She also suggests using deer resistant plants like Coral Bells and Lenten Roses. Hand’s down it’s all about TOMATOES! Do you have a particular outdoor spot at Springmoor that you like best? The new fountain area near the croquet court is one of everyone’s favorite spots too. Located by the South Village Dining Room, you can enjoy the swings, grills and bench seating all year ‘round. What sources do you use for gardening tips (magazines, books, websites, etc.)? 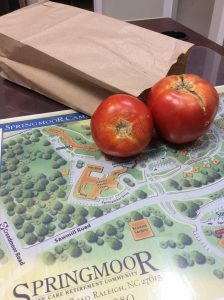 If you would like to tour our beautiful grounds and find out more about the amenities at Springmoor, please call 919-234-7626 to schedule a visit. 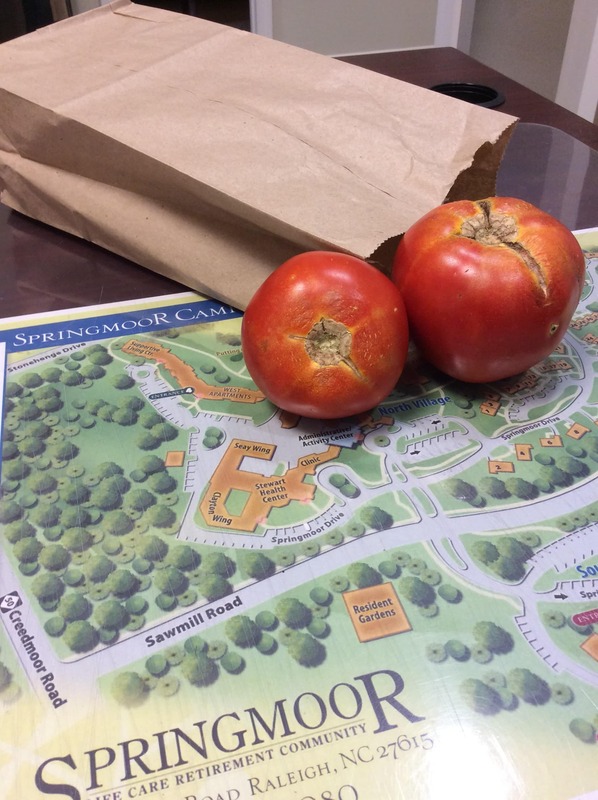 And a final note: This writer is most appreciative of the Springmoor Gardeners and the donations that appear on her desk. 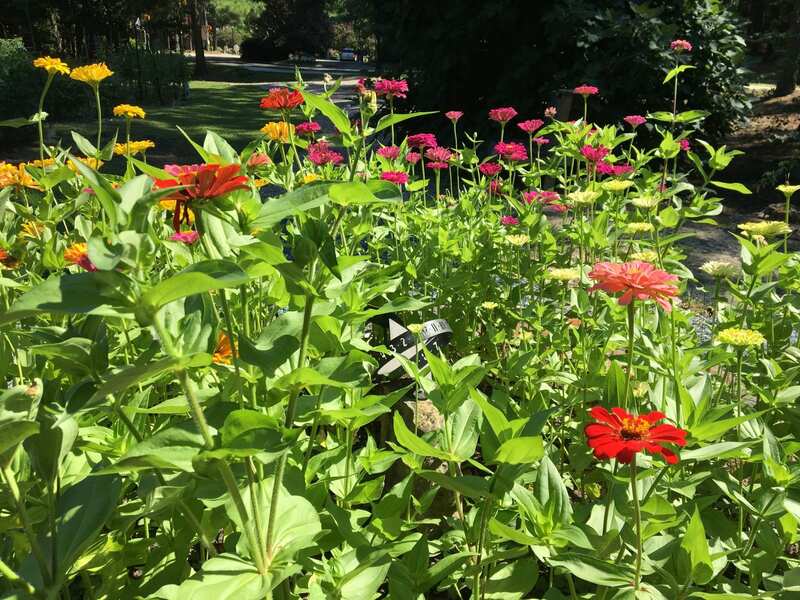 There is nothing better than a homegrown tomato, fresh zucchini or a vase full of zinnias!